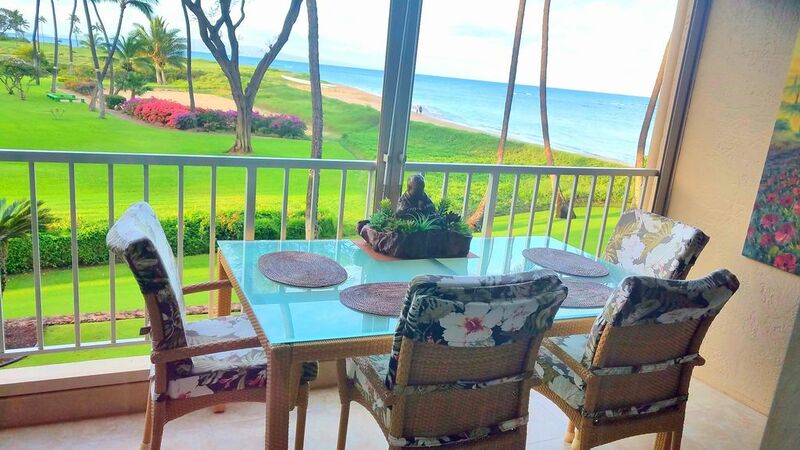 Oceanfront 2/2, Outstanding View, Perfect Maui Getaway! Gorgeous, completely upgraded oceanfront/oceanview 2 bedroom, 2 bath. This condo is exquisite and has been meticulously renovated for the discriminating traveler. Huge, unobstructed ocean and island views from the living room, lanai and master bedroom. In fact, you don't even need to get out of bed to take in the oceanview from the master bedroom! The kitchen has been fully renovated with beautiful granite counter tops and brand new cabinets. The master bath has a brand new jet tub, and both bathrooms new tile and fixtures. There is 50' LCD TV in living room, 46' LCD TV in master bedroom, beautiful artwork, and more. Menehune Shores offers a large rooftop for sunsets, BBQs and whale watching (during whale season). You can also enjoy the fabulous Indian restaurant on site. We are close to beaches, shopping, restaurants, and everything South Maui has to offer. Start your vacation now by checking our calendar for availability! I have lived on island for 13 years and I truly love Maui. My home is just blocks from the condo so I'm easily accessible if needed. My full time job is working for a snorkel boat company, so I'm all about customer service and make sure you enjoy your stay! Amazing view, well kept grounds, wonderful staff, and so convenient! The owners stay in the condo for 2 1/2 months out of the year, so it's set up to live in, with all the amenities at your fingertips! We have portable bocce and horseshoes that you can use on the lawn and sand area just outside the condo! Plus, there is shuffleboard by the pool! Our condo is conveniently located in North Kihei. We are 5 minutes for grocery stores, restaurants, shopping, and surfing, and 10 minutes for Maalaea Boat Harbor for snorkeling, diving, and fishing. It's a really great location! The required refundable security deposit of $250 may be waived with the purchase of a third-party property damage insurance, provided by CSA travel insurance. This damage insurance provides up to $1500 of coverage for accidental damages caused by you or your traveling companions. It is available for purchase through the manager for a cost of $59. Damage insurance can be purchased any time up to and including check-in. Purchase information and policy details will be sent in your reservation confirmation. VRBO/Homeaway Service Fees are charged to guests who choose to book through the VRBO/HomeAway pages, rather than through the management or owner directly. It comes with 24/7 customer support, the ability for a guest to book instantly, and VRBO's peace of mind guarantee. These benefits do not necessarily supersede protections and support available from the property management company.